From 400 we become 200 and it happens because of you - please vote for me here. First of all I want to thank everyone who voted for me - this is not something I could do alone because if it was we could dispense of this entire competition and simply declare me the Food Blogger Extraordinaire; in fact if I could I would declare all kinds of things and bestow many accolades upon me, I would give myself the Nobel Prize for blogging if I had things my way. All silliness aside thank - you. Now on to the next challenge. This second challenge threw me for a loop a little since I dont have anything outside of my comfort zone. I know that sounds grandiose and all encompassing to say the least but it is how I feel. I will try anything and more than likely I have. I struggled hard to think of something that you couldnt find on my blog if you went through my archives. It would have been easy for me to pick something and try and pass it off but if you did a little research you might find that I had made it before so that is where we get to Morocco. I have not posted nor made a Moroccan dish in my memory - this cuisine is outside of my comfort zone, so to speak. I dont use recipes - I read recipes and learn the ingredients and since I know a lot of technique I pretty much follow my instincts, that is what I did with this dish. I did look at this recipe for basic inspiration and, like the speed limits in Manhattan, this was a guideline. Season lamb with salt and pepper. In a large pot, heat 2 tablespoons of olive oil and brown the lamb over medium heat. When lightly browned, sprinkle lamb with the za’atar and add the harissa paste. Cook for a minute until the spices are fragrant, then add just enough water to barely cover the lamb. Bring to a gentle simmer and cover. 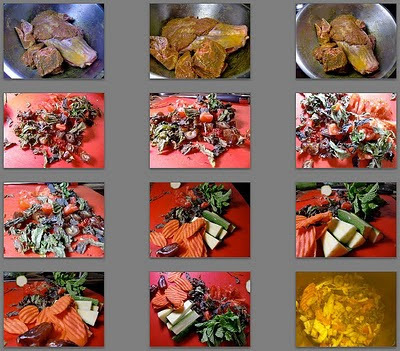 Let cook approximately 2 hours, adding additional water as necessary, until lamb is tender. Using a sauté pan add 1 tablespoon olive oil and sauté the zucchini, onion, carrots and garlic until lightly browned. Transfer the vegetables to the lamb stew pot and continue to cook another 30 minutes. The stew is done when the lamb is tender. While the stew is cooking, steam the couscous according to the directions. Once it is cooked, fluff it with a fork. Add the raisins(dates), chopped mint, and salt and pepper to taste. There you have it - my little journey to North Africa, the dish was tasty, satisfying and absolutely delightful it is definitely in my comfort zone now! See having great flavors all in one bowl served family style can be exciting. Voting starts tomorrow on the 27th of September - I will post a link for you. Here we go friends - prepping for challenge #3 - who wants to come to a dinner party? This looks so delicious! It's weird stepping outside ones' comfort zone but so worth it when the results are this good. What? No Pulitzer? Very nice entry and I like the idea that you decided to go for it and used a shank. Good luck! Is there a Nobel Prize for bloggery? I just didn't know that. Love one bowl dinners - time to go to Morroco! Love the dish too! 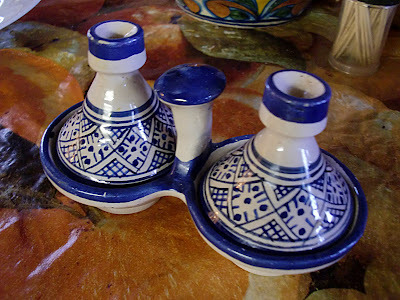 With that dish, you had to do Morrocan! The lamb looks BEAUTIFUL! Good luck and I hope we can both advance to the next round of #PFB2010! Whoa, this looks beautiful!! I have never cooked Moroccan either. Reading through your recipe I love all the foreign spices and things I have never heard of. You're lucky you're in NYC where you can readily find all of that! A great earthy dish. Moroccan food is always so comforting! Congratulations on moving forward! Oh boy, you have pulled out all the stops with this one. 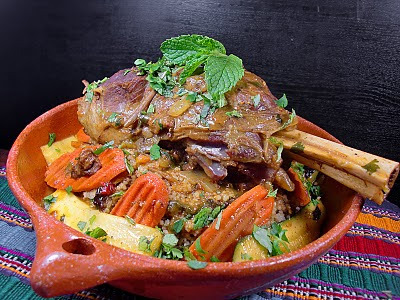 Moroccan flavors are so lovely - great dish! It's awesome! Getting hungry just looking at that lamb :) Good luck in the round 2! This is the 3rd Moroccan dish I have seen and I am loving it! Very impressive Christo. Good luck in round two. We're with you all the way. Looks pretty authentic and delicious, just like the one my Moroccan friend makes. Good luck with the challenge. Looks divine! A Middle Eastern slow cooked feast! Well done-hope you win!!! Oh Christo I hope you win! I have always thought you should have your own show since you have such a unique style of cooking and well...your a character! This challenge is not as easy as some may think especially w/ your experience. Good job and you got my vote! Looking good Christo! i might have to try that, don't cook lamb that much, but you make it look delicious! You have my vote! I LOVE Moroccan food but have never bought harissa. Thanks for the recipe! Oh my! Again, mouth waterage! This dish looks fantastic! 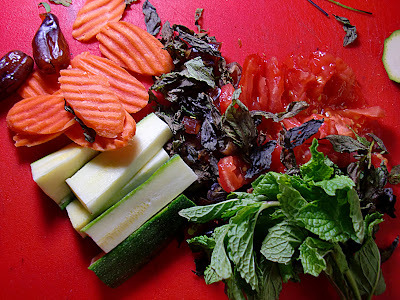 The flavors sound great...I love za'atar. Good luck in the contest! This looks like a wonderful dish!! I am a big lamb fan, Iso I will give this a try! Best of luck and you have one of my votes! What a beautiful and interesting entry. You have my vote. Good luck! Dude, you know i would vote for you for President! This is a beautiful dish. Craving big time over here. Great post! Looks delicious. I voted for you! Love your little tagine! You're going straight to round 3 friend! Yummm, that lamb looks so savory and delicious. Well done! I am getting to a point of loving lamb. We didn't eat it (Mom didn't make it) as a kid so I am only discovering it now. Great job Doggy! 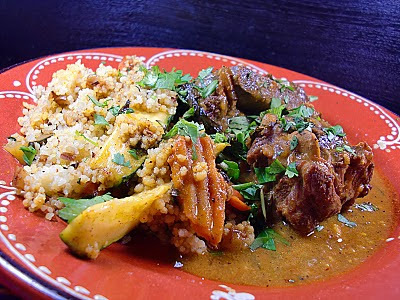 I've been cooking lamb couscous for a long time because I"ve been lucky enough to have a Bedouin friend that owned a restaurant and we would go on Wednesday for his special couscous night! Also good in the mix are turnips and a bit of cinnamon. We used to use harissa as a condiment with merguez sausage. YUM! I've also made the actual couscous using apricot nectar, very nice indeed! Well done, off to vote now! Ooh, I forgot, Said would also put chickpeas in his stew too. YUM! You won my vote and my respect. I like your post and I love your hustle. You leaked your menu to get votes and I am very impressed. Good Job and Good Luck my friend. Morocco, done. Got it. Good luck with moving on from this round! Looks great! I sent you a vote. Beautiful dish - looks amazing and you totally deserve a win! shh don't tell anyone but that's the best looking Moroccan dish I've seen thus far this challnge. The meat just looks so juicy. 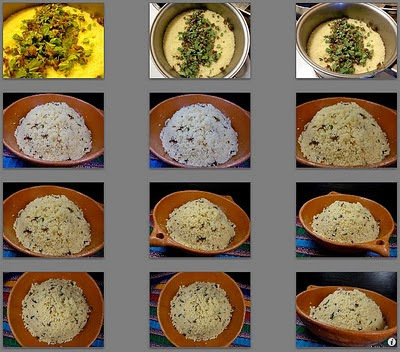 I had a similar predicament, but ended up identifying a new cuisine and loving the results! 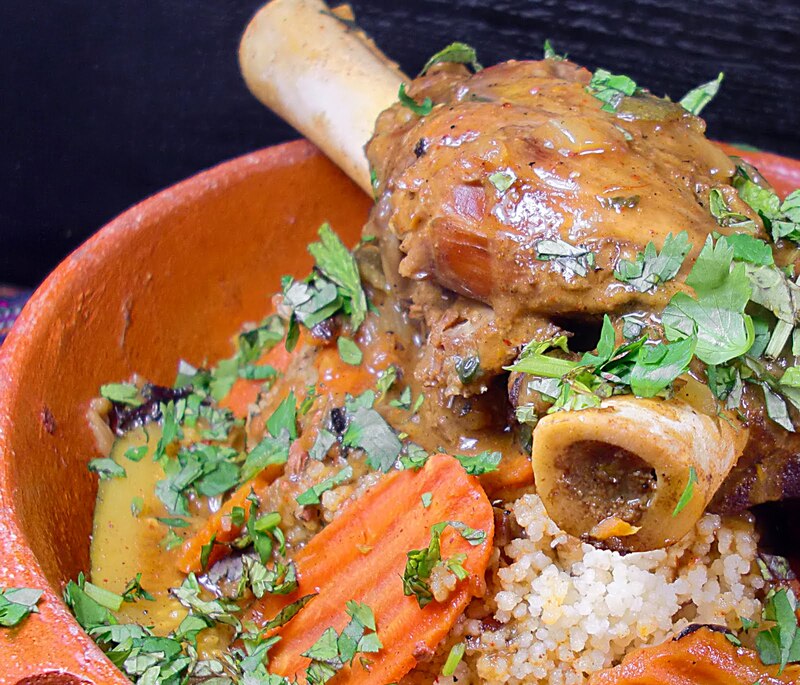 I love couscous, and my favorite one is actually from a Moroccan restaurant in the East Village... yours looks very similar to that and super delicious! Great job! Right back at you! Voted and tweeted - good luck!! The lamb shank over the couscous looks amazing! This was a great challenge! when life gives you lobsters - make bisque!